Oft-maligned hitmaker's third album doesn't do much to convince the haters that he's not the hack that they think. 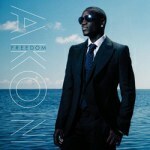 Akon’s had plenty of smashes, some great (“Smack That”) and some truly bizarre, if not out right awful (“Lonely”). He’s written and produced hits for Young Jeezy and Gwen Stefani and he signed T-Pain -- his contemporary hitmaker and the guy who will go down in history along side him -- to his label after Pain released a guerilla remix of Akon’s breakthrough hit “Locked Up”. He will probably be remembered for some of these things, but the true reach of his power was seen late last year when he released a digital download called “Sorry, Blame It on Me”, which was his totally insincere public apology after he got caught on camera throwing some hapless kid off of a stage at a concert. It peaked at number seven on the Billboard Hot 100. Like T-Pain it appears as if Akon’s status is slowly waning. But unlike T-Pain, who has released some of the best music of his career this year, Akon’s slow descent has coincided with a creative decline. That Akon seems to be falling off quicker than T-Pain shouldn’t totally be a surprise. Akon has always operated with a smaller palate than Pain, mining dancehall and reggae in a way that’s been continually palatable to American ears (read: slightly elementary and unimaginative) or the sounds of straightforward hip-hop and R&B, though he’s no doubt had a hand in defining what those “sounds” are. Akon is a singles artist first and foremost, and the fact that the two singles off of Freedom aren’t worldwide hits is indicative of both his writers block and that his third album probably won’t be stringing along a fifth or sixth single by next summer. Those two singles, “Right Now (Na, Na, Na)” and “I’m So Paid”, aren’t even bad -- if anything they’re just pedestrian by Akon standards. “Right Now” sees Akon showing off slight house influences, a thread that runs through Freedom, and though its chorus is undeniably catchy, the fact that it winds up being lines ending in “na, na, na” is reprehensibly lazy. “I’m So Paid”, the better of the two, aims for the breeziness that “Don’t Matter” achieves, but something about it just feels a little off. Maybe its barely there beat is just too barely there. Or maybe it was just stupidly released in winter. “Holla Holla”, the T-Pain collaboration, is sonically more indicative of a Pain production, and that its chorus is just, “I wanna holla, holla/ holla, holla” (repeat), indicates that it might be an unfinished scrap from Pain’s world’s better Thr33 Ringz. The fact that T-Pain, in his one verse, easily wipes the floor with Akon indicates that T-Pain is the superior lyricist and artist, but we already knew that. Elsewhere, Freedom doesn’t really offer much else. The title track, a ballad, is a nice enough tribute to his mother and “Beautiful”, which has a synth line curiously similar to the instantly identifiable one from Alice Deejay’s “Better Off Alone”, is good as far as beginner house songs aimed at teens go. Mostly though, the songs on Freedom sound exactly like each other, built from clunky, obvious drums, unimaginative synth compositions and repetitive choruses. Nothing here besides his (sometimes iconic) whiny voice indicates that Freedom is an Akon album. If anything, the album sounds like a CD-R of demos that an aspiring pop star wouldn’t mind losing. Which means that it turns out that the only thing worse than a random guy lazily biting Akon songs is Akon lazily biting Akon songs.